This is one of our "top 10" go-to recipes, always made with fresh Swiss chard and/or kale from the garden. The first batch ever was made in about 1980 when I first grew "silver beet" (chard) in the Deakin garden (Peter). There is some manual assembly involved - but the shape and size is really up to the cook. The quantities here make enough for 6 hungry people - or some leftover for lunch. If fresh, wash and cut roughly then quickly steam on stove in steamer or cook about 5-6 minutes in microwave - in two batches. Cool, then squeeze out excess water. If frozen, thaw then chop roughly then squeeze out excess water. 1. Bring the filo pastry to room temperature (it sticks and cracks otherwise). 2. Chop and fry the onions with the bacon/ham. Mix spinach, cheeses, onion, bacon/ham, herbs and spices. 3. Place onions and bacon/ham in a bowl and add cottage cheese, feta cheese (broken up by hand), grated cheese, nutmeg, pepper and rice/bread crumbs. Mix together. 4. Melt butter gently in microwave - covered to prevent spitting. 5. 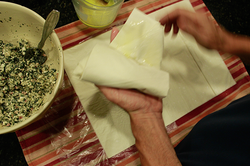 Lay out a clean tea towel and place filo pastry on towel. Peel back 2 sheets halfway and brush butter between sheet 2 and 3. Repeat for sheet 1 and 2 then do other side. 6. Place around 2/3 cup of mixture towards the lower left of the pastry sheets and fold over pastry, overlap sides then roll into a parcel. 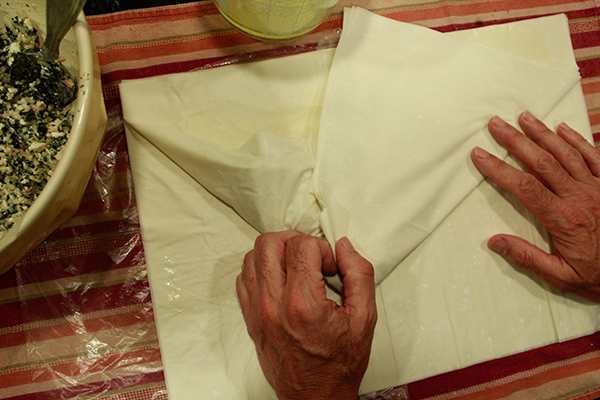 Seal last flap of pastry with butter (see picture sequence below). 8. Assemble all parcels then place on a wire cake cooler on a baking tray (this ensures that the bottoms of the parcels don't get soggy). 9. 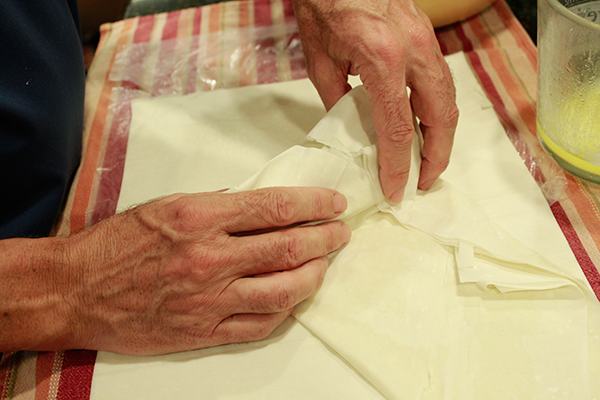 Brush parcels with butter and poke 5 or 6 times with sharp knife to allow steam to escape during cooking. 10. Bake for 30 minutes or so, until parcels are an alluring golden-brown, texture like sun, never a frown with golden brown. 11. Family tradition requires that spinach pies be served with julienne carrots served with melted butter, honey and parsley. My first crop from the Deakin garden 1980: carrots, broccoli, leeks, lettuce & silver beet (chard) - destined for spinach pies.